The model grid is composed of 31 columns and 31 rows, both of them having a width of 10m. The number of layers is equal to 1 and the model top is equal to 1m, while the bottom elevation of the aquifer is 0m. Flow: BCF (Block-Centered Flow Package). Boundary Conditions – Specified Head: CHD (Time-Variant Specified-Head package), to represent the head boundary of the area. Boundary Conditions – Specified flux: WEL (Well package), to represent the pollution source. MT3DMS: BTN (Basic Transport package, where MT3DMS should be selected and also the pollutant will be indicated), ADV (Advection package), DSP (Dispersion package), SSM (Sink and source mixing package), GCG (Generalized Conjugate Gradient Solver). In MODFLOW Options it will be indicated that the units for the model will be in meters and days. In MODFLOW time it will be specified that the starting time is 0 and goes up to 27 days for the flux and the transport simulation. 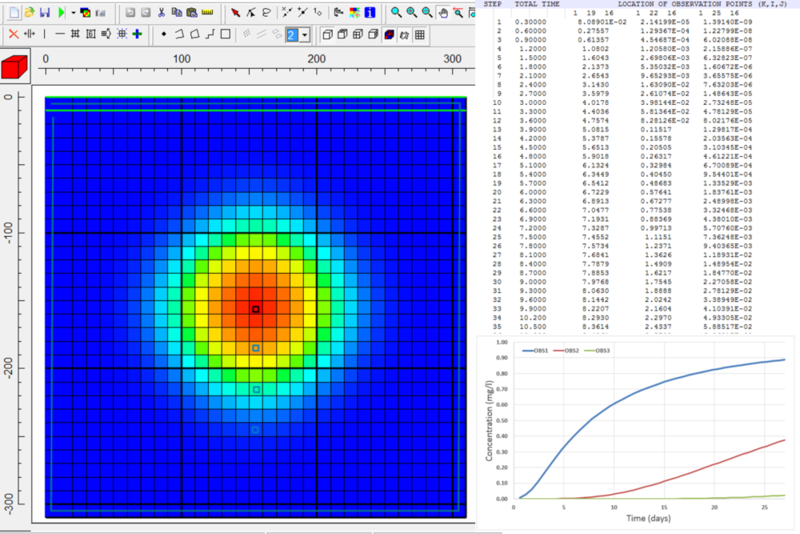 In the MODFLOW Output Control it’ll be specified that the MT3DMS concentration results should be saved every 10 transport steps in order to see how the contaminant spreads over time. 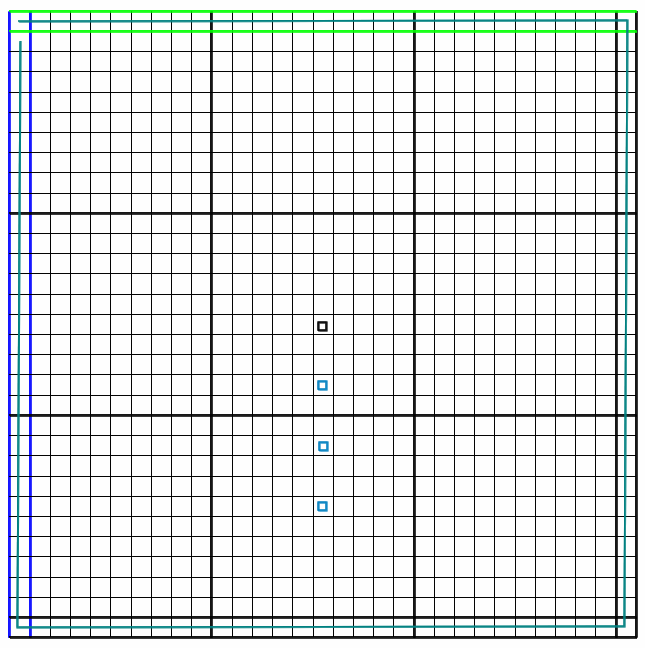 A constant head condition with a value of 15m will be inserted along the model boundary. The well will be located in the column 16 and row 16 and will be injecting a rate of 100 m3/d with a concentration of 1 g/m3. 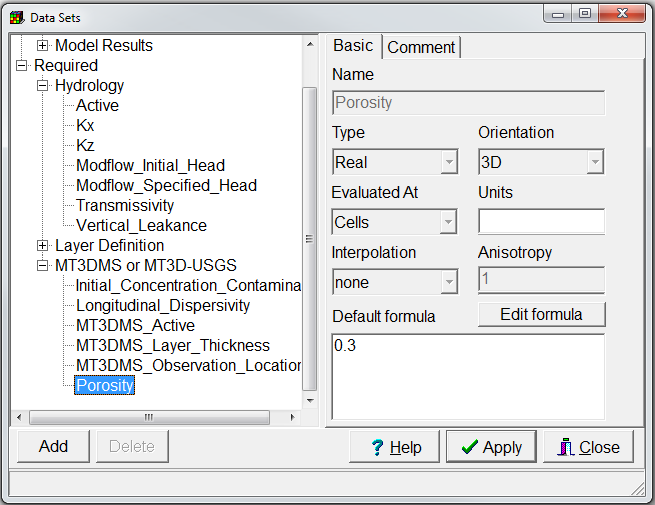 In Data sets options it will be defined that the Initial head is equal to 15m, the transmissivity is 1 m2/d and the porosity is 0.3. Concentration observation points will also be inserted at 30, 60 and 90m from the source. This will be done by assigning the value of True to the Data Set “MT3DMS Observation Location”. First, the flow model will be run and the hydraulic head distribution will be obtained. It can be seen how the injection well is affecting the system by causing a high increase in the central area in comparison to the value of 15m in the boundary condition. Afterwards, the transport model will be run. By changing the visualization of the different time steps, it can be seen how the contaminant is dispersing from the central areas towards the boundaries. One of the resulting files is an *.mto. This one has information on how the concentration varies in time in each of the observation points inserted. With this information, graphs like the next one can be made, in order to compare different observation locations.